When I started at Fluid Imaging Technologies one of the draws of the position was that I would get to see the world. In supporting our customers, I have done exactly that. Recently I was able to spend a significant time abroad traveling to Singapore, the United Arab Emirates, and India. I had the opportunity to work with scientists in a variety of industrial and research applications to ensure that their instrument and methodology were optimized for their needs. Paleolimnologists study the diatoms, foraminifera, and other microfossils within sediment cores to reconstruct paleoenvironments and understand how they have changed over time. 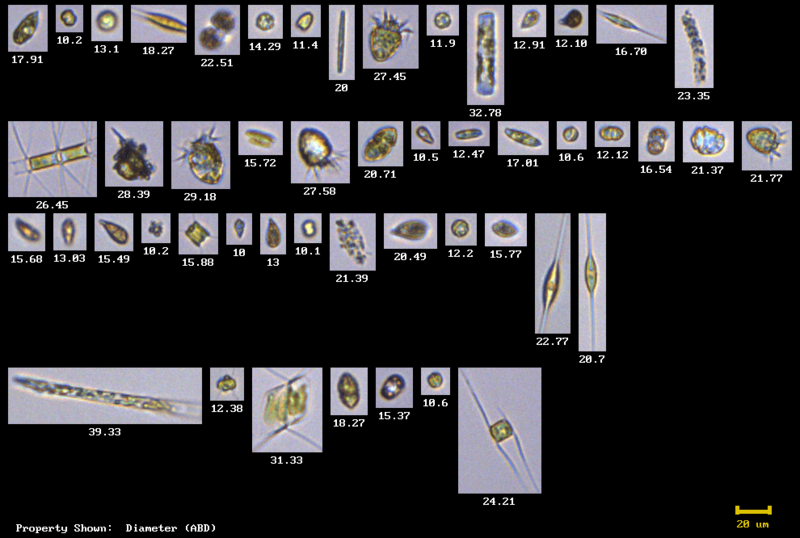 Diatoms are among the most common types of phytoplankton, and originated more than 200 million years ago. They are commonly monitored when studying water quality, both past and present, because of their sensitivity to a variety of ecological conditions. The University of New England and the University of Maine School of Law announced that they are offering a combined fast-track Marine Sciences Law Degree to be completed in only 6 years. 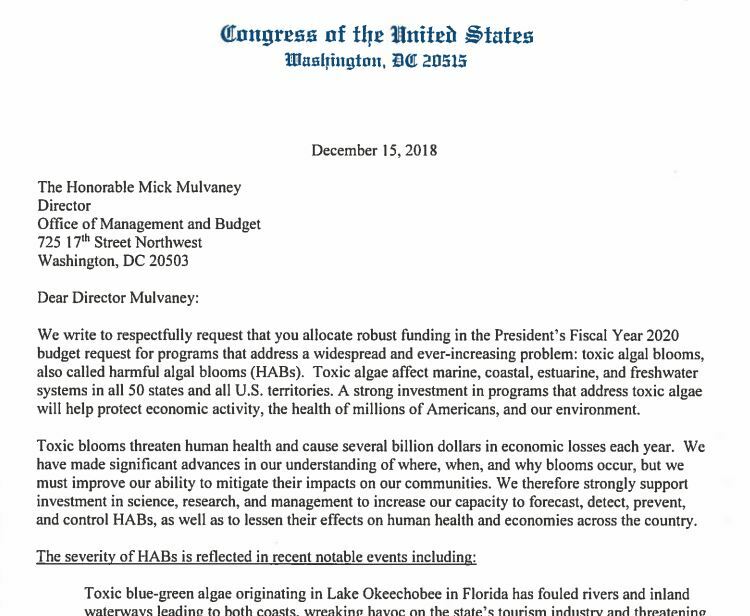 In December 2018, U.S. Congress submitted a letter signed by 61 Congressional Members to the Office of Management and Budget to lobby for increased funding to support harmful algal bloom (HAB) research in 2020. HAB events are widespread and their effects are diverse. Coordinated studies released in 2017 by the Environmental Protection Agency, U.S. Geological Survey, and National Oceanic and Atmospheric Administration showed that 39% of all lakes nationwide contained toxic algae, and cyanobacteria-produced toxins were present in 78% of those lakes at some point during the year. Additionally, 40% more HAB events were reported in 2018 than in 2017. We use our Flow Imaging Microscopy blog as a platform to serve up the latest in relevant news, highlight novel uses of the FlowCam, and announce FlowCam technology developments. This year we blogged about 54 different topics. Below is a recap of the Top 10 Most Read Blog Posts of 2018. 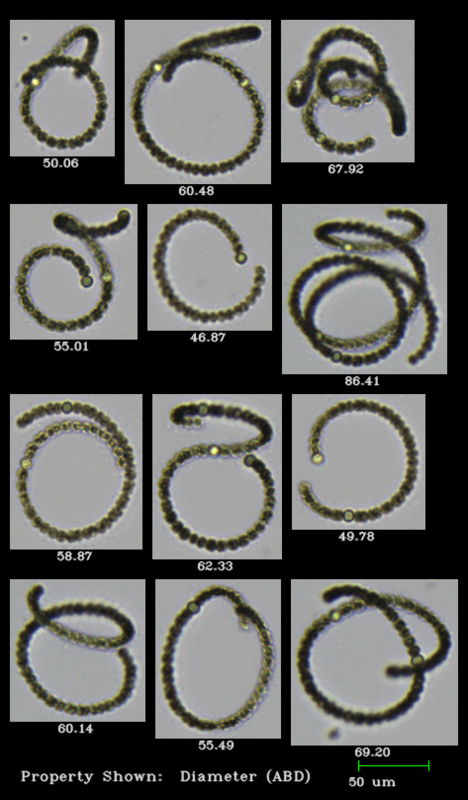 December 2018 — Can microplastics be mistaken for algae? 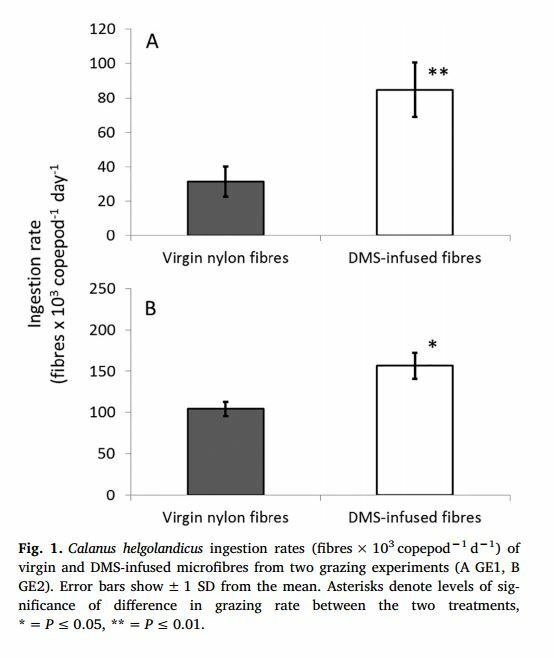 A recent study by the University of Plymouth and the Plymouth Marine Laboratory demonstrated that nylon microfibers can acquire dimethyl sulfide (DMS), a compound produced by algae, when environmentally exposed to the compound. 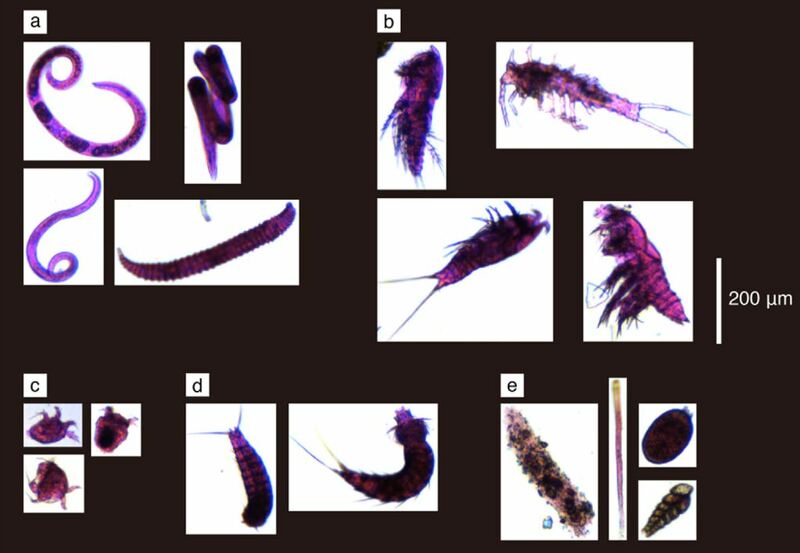 The study also showed that Calanus helgolandicus, a chemosensing copepod that uses DMS to locate algae, their normal food source, more readily ingested microplastic fibers infused with DMS (Fig. 1). 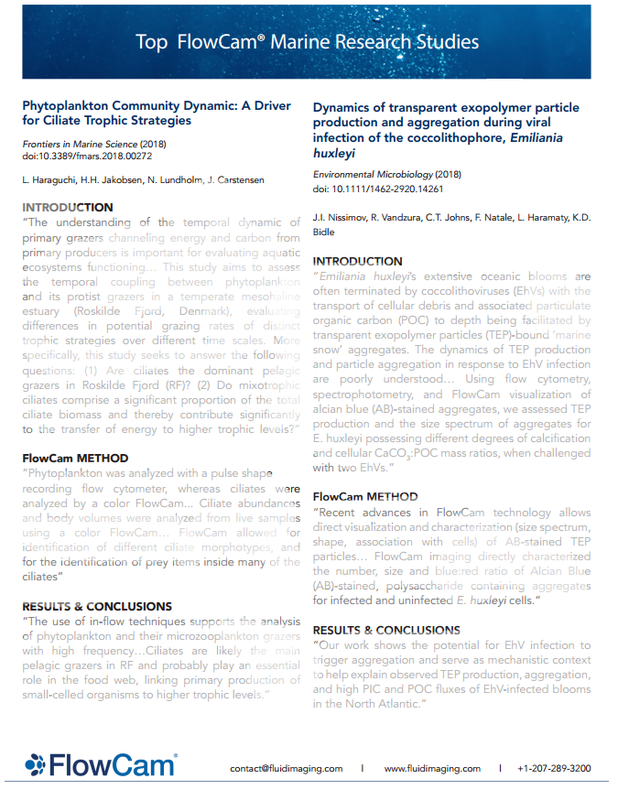 The FlowCam was used to enumerate the microplastic fibers and evaluate microplastic fiber uptake during the experiment. December 2018 — Microplastics are an ubiquitous concern for the world's oceans. Increasing demand for consumer plastics has resulted in an estimated 4.8 to 15.11 million metric tons of plastics entering the oceans every year1,2. These macroplastics degrade into microplastics, or plastic fragments <5 mm in diameter, which can range in morphology from rigid pieces to amorphous fibers. Researchers from the Japan Agency for Marine-Earth Science and Technology, and Am-Lab Inc. developed a methodology to use the FlowCam® for analysis of sediment-inhabiting meiobenthos. Meiobenthos are small, benthic invertebrates often used as indicators of anthropogenic influence and other natural disturbances. They play a primary role in sediment nutrient cycling and stability in benthic ecosystems. Meiobenthos imaged by the FlowCam. Organic matter was stained with Rose Bengal to easily differentiate meiobenthos from inorganic particulates, such as sediment. 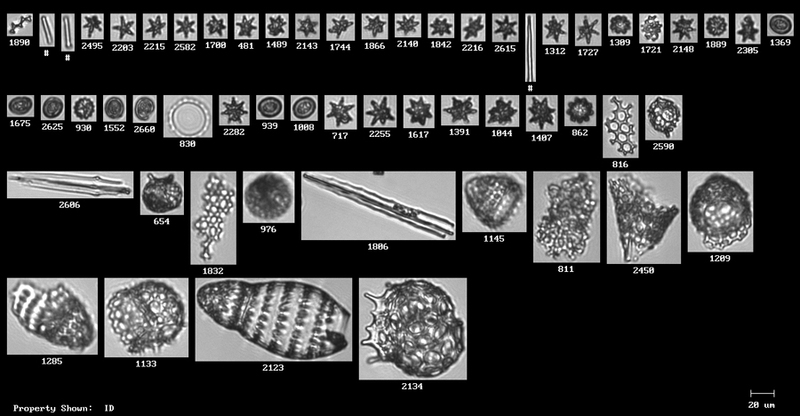 Imaged organisms are labeled as follows: a) Nematoda; b) Copepoda; c) Nauplius larvae; d) Kinorhyncha; e) Foraminifera. Credit: Kitahashi et al. (2018). Optical microscopy, which is labor-intensive and time-consuming, is often the primary technology utilized for analysis of meiobenthos. In this study, Kitahashi et al. developed a method to use the FlowCam and VisualSpreadsheet® for analysis of these small, benthic invertebrates.